Lauren Holly appear in the two leading roles as serial killer Ryan Weaver and airline employee Teri Holloran in this high-flying thriller. Police Detective Hines (Hector Elizondo), who has more than a fleeting knowledge of Weaver and his past deeds, and Captain Bowen (Ben Cross) try to assist the overburdened heroine over the air waves as she attempts to keep the beast at bay and the plane under control. It not only keeps you rolling on the edge of your seat, it also gives you the gimbals. 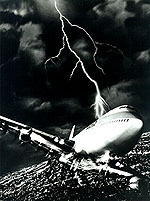 What could have easily might have become a boring nineties version of the Airport films is saved from mediocrity by Robert Butler, a director with a knack for excitement, and the strong combination of two producers, Martin Ransohoff and David Valdes, who have a long record of knock-out films behind them. The perfect film to watch while flying. Unfortunately, in accordance with an old story structure formula applied with some frequency many years ago, the first section of the film attempts to remain ambiguous about the dangerousness of the killer in order to exploit his potential appeal and attractiveness as a character. In order to discuss the plot, analyze the film, or just generally tell your friends what it's about, however, it becomes necessary to reveal his true nature and therefore ruin the element of surprise. All I can suggest, if you should prefer to experience the full impact of this revelation, is not to read this review. Too late.